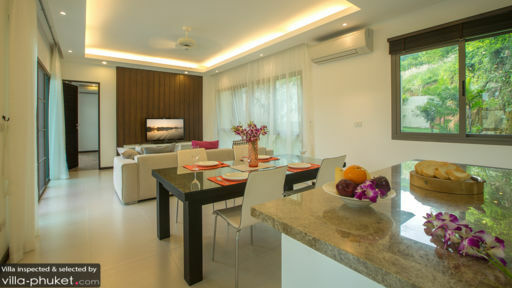 Villa Damar is a modern holiday villa near the shores of Nai Harn beach, Phuket. The three-bedroom villa features a luxurious swimming pool outdoors bordered by the periphery of the villa and lush, green tropical vegetation. 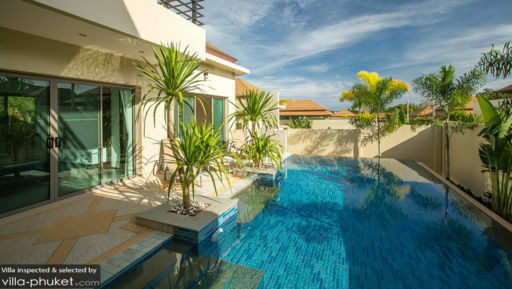 Nestled amidst the tranquil surroundings of Nai Harn, the villa is close to many engaging and interesting sights in the area including Laem Ka beach that is famous for its pro-swimming waters. The beautiful, blue ocean is not too far from the property so you can make your way to the pristine, white sand beaches and enjoy stunning sunsets and views of the outlying islands. Villa Damar is home to three, identical bedrooms and two are found upstairs with private balconies and the third is downstairs right next to the pool deck. The bedrooms feature wooden floors, sophisticated décor and king-sized beds. Air-conditioned and fitted with cove lighting, the bedrooms are modern and simplistic. The upstairs bedrooms allow you to relish the fresh tropical breeze by hanging out on the balcony with your morning tea or evening coffee as you take in the tranquil ambiance. Downstairs, you have the luxury of first dibs on the swimming pool as the bedroom slides open to reveal its crisp water. All three bedrooms come equipped with ensuite bathrooms. The outdoor area at Villa Damar is majorly occupied by its 8-metre swimming pool with vibrant, blue water and ample greenery for contrasting and magnetic colours. The refreshing and serene atmosphere is likely to make you feel relaxed and rejuvenated. Lie back on the sun chairs found beside the pool to bask under the tropical sunshine and work on your sun-kissed holiday tan. Hang out with your friends with chilled cocktails around the pool from morning until late into the night as this villa is your home away from home. There are lush gardens towards the back of the wall, idyllic for your morning yoga. Just as you have the poolside, the main living area at Villa Damar is located right adjacent to it so you can enjoy the tropical experience of indoor/outdoor living. The living room is modern and well-designed with elegant interiors featuring a plush, beige sofa, beautiful flower settings and modern conveniences like air-conditioning and a flat-screen TV along a panelled wall. There are doors on either side of the living area and the back doors lead you to the garden in the backyard. For a pleasant meal with your friends or family, dine on the indoor dining area in the living room that presents classic dining table in black and white. Finally, you have the western-inspired kitchen that is fully-equipped with state of the art appliances, granite countertops and induction cooktop for your convenience. You can prepare anything from light snacks to entire courses using the many facilities provided to you in your private kitchen. The villa accommodates many of the needs of guests making sure to provide you with the best experience possible. There are many services available complimentary to your stay such as housekeeping, maintenance and security, coffee maker and parking. Other amenities are available at an extra cost such as airport transfers, car and driver, baby cots and massages. 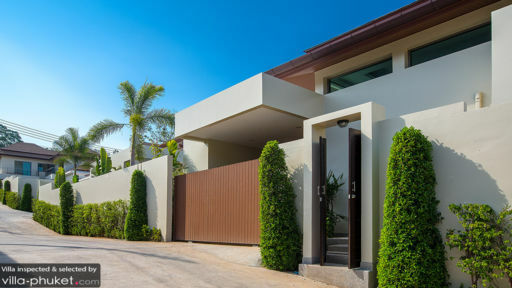 Villa Damar is conveniently situated close to Nai Harn beach which is again near many popular sights in this area. There are beaches such as Laem Ka beach where the water is good for swimming or Nai Harn beach where you have people lounging on the sandy shores enjoying the summer’s day. Some notable cafes and restaurants in the area include the beachside Salaloy Seafood and The Book Café.